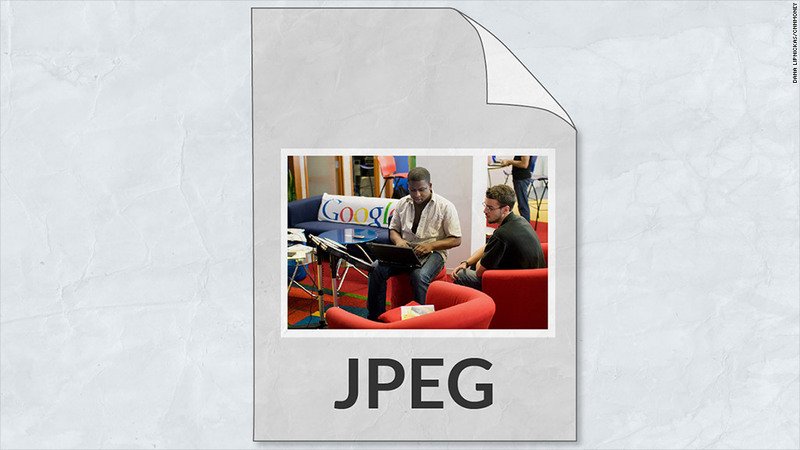 Google's new WebP image file format promises to speed up the Web by reducing image sizes. Giant photos are slowing the Web down. Google has a plan to make your pages load faster. The search giant has developed a new kind of image format that promises to shrink the size of Web photos and graphic files down by about 35%. That's a big deal, considering that images are responsible for nearly two-thirds of the size of an average website -- a figure that grew by more than 30% last year, according to the HTTP Archive. Those old, familiar image formats are the culprits. Next to Flash animations and videos, JPEGs are generally the largest files on Web pages. GIF and PNG files are pretty big too. To boost load times for websites, Google (GOOGL) developed a new image format, called WebP. At its I/O developers conference last month, Google announced that it has converted most of YouTube's thumbnail images to WebP, improving the site's load time by 10%. That may not sound like much, but Google says that alone has saved users a cumulative 140,000 hours each day. Google has also changed the Chrome Web store and Google Play store over to WebP, speeding up load times on those sites by nearly a third. Facebook, Netflix, eBay (EBAY) and several other websites have also begun supporting WebP. When Netflix (NFLX) first experimented with WebP late last year, it found that some Blu-ray players running Netflix couldn't load the thumbnails. Some Facebook (FB) users freaked out that their browser software didn't work when the social network shifted to WebP last spring. Mozilla's Firefox and Microsoft's (MSFT) Internet Explorer still don't support the format. That's left more than half of the world unable to view WebP images. So website developers still need to upload JPEG, GIF and PNG file formats to their sites, even if they also support WebP. Yet there's reason to believe WebP is turning a corner. Google recently announced that WebP supports animations, which were previously the exclusive realm of GIF files. Content delivery network Akamai (AKAM) has developed a tool called Aqua Ion, which automatically converts photo files to WebP for the websites it hosts. And despite earlier hiccups, Facebook and Netflix are still committed to WebP. So if your pages load a bit faster in the near future, you might have Google to thank.